One of the things we brought from Finland was Mölkky, a throwing game. It's kind of like lawn bowling, and since there is throwing involved, Hobie is of course very interested. 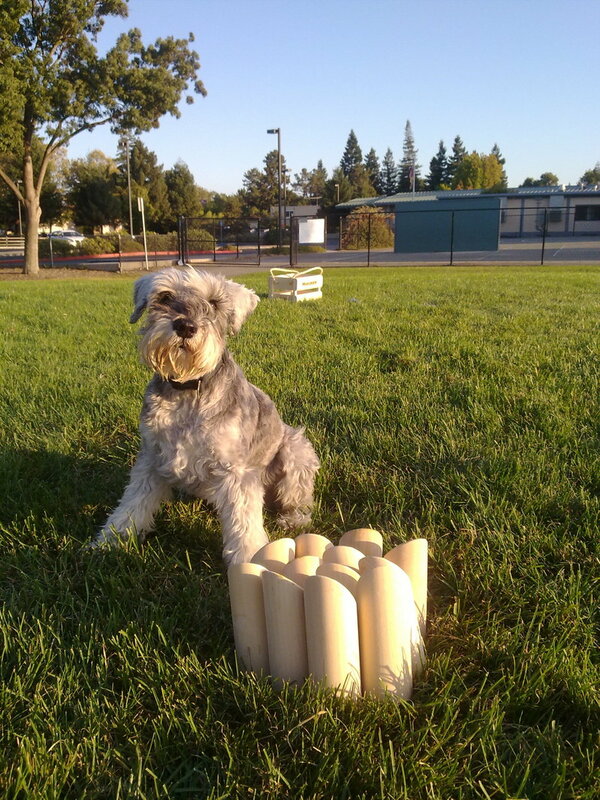 We went to the Whisman School Park in Mountain View after a walk, and set up. I hoped Hobie was tired after walking for an hour, but once the game was set up and things were flying in the air all thoughts of tiredness were forgotten. Although Hobie sits still in the picture, he spent the entire time running around the game. Although he didn't interfere with the game, I think he (not so) secretly hoped this would turn into a game for him. The Whisman School Park is a good neighborhood park for dogs as they are allowed off leash in one corner. Officially it is only for off-leash training, but it looks like the local dogs are usually having a good time playing. One of the regulars told us to be on the lookout for park rangers and just leash Hobie should we see one. Looks beautiful in Cali! Sounds like you guys are having a great time there. Hobie's looking good too. By the way, Jas and I got a puppy! This page contains a single entry by Kris published on October 25, 2009 10:52 PM. Hobie's new girlfriend was the previous entry in this blog. Happy Halloween! is the next entry in this blog.